Embody Chair | Herman Miller Chairs | Herman Miller Furniture (India) Pvt Ltd.
With Embody, designers Bill Stumpf and Jeff Weber set out to solve the problem of the lack of physical harmony between people and their technology. They worked with more than 30 physicians and PhDs in the fields of biomechanics, vision, physical therapy, and ergonomics who contributed their expertise to help guide the development of this office chair. As a result, you feel Embodys responsive ergonomics the moment you sit downlike you are floating, yet perfectly balanced. 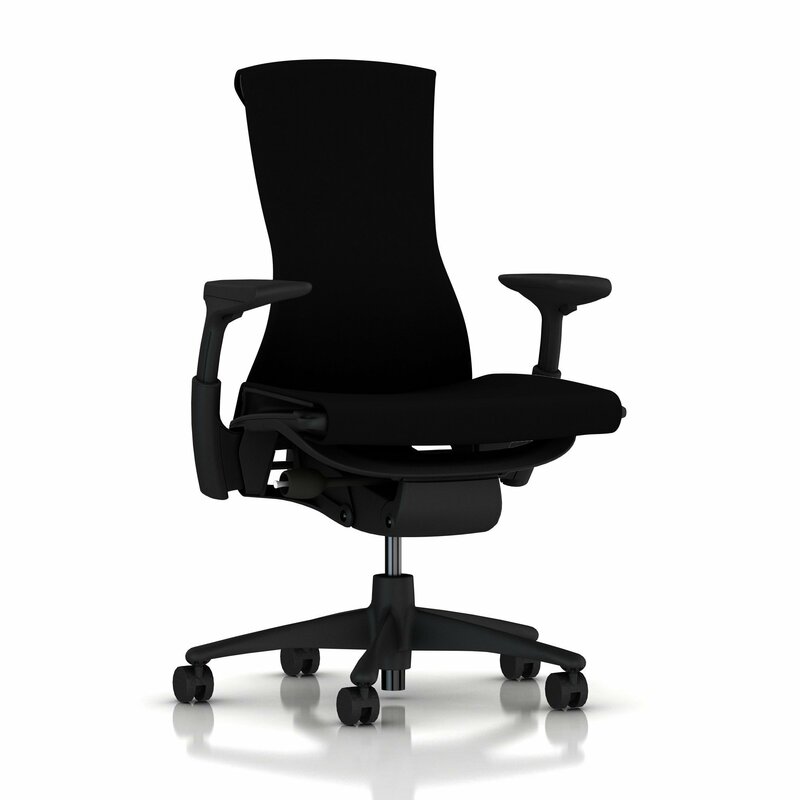 The seat distributes your weight evenly while supporting your bodys micro-movements. The narrow backrest allows you to move freely and naturally as it automatically adjusts to support a full range of seated postures. By reducing seated pressure and encouraging freedom of movement, Embody allows blood and oxygen to flow more freely, which helps keep you focused. "Sitting is bad for you. Embody is good for you." A combination of support layers in Embodys seat work together to reduce seated pressure. These layers were designed to allow for airflow, keeping you cool and comfortable as you sit. Embody encourages movement, keeping your body and brain limber all day, and helping you stay focused and relaxed at the same time. Thats good, because movement promotes blood and oxygen flow, which keeps the brain more focused. Embody encourages the most healthful posture for computer usersâ€”a working recline, which reduces spine compression and even slows fluid loss from discs. The Backfit adjustment positions the backrest in line with your spine's natural curve, from your sacrum to lumbar and upper thoracic. When you move in this office chair, your head remains properly aligned to your computer display. Embody's tilt technology maintains your back in a fixed position relative to the seat, encouraging your body to move naturally into the most positive seated postures while keeping your pelvis stable. The tilt technology of the Embody chair also provides three zones of support for your thighs, sacrum/sitting bones, and thorax. The pelvis remains stable with no rearward rotation. Without a rigid frame and with edges that flex, Embody prevents uncomfortable pressure on your legs and arms. A dynamic matrix of pixels creates seat and back surfaces that automatically conform to your every movement and distribute your weight evenly. One chair size fits every body because Embody automatically adapts to the wide variation in the sizes, shapes, postures, and spinal curves of different people. Leaps of faith, in terms of re-imagining what a chair can be, are nothing new at Herman Miller. But even we were surprised at the radical idea proposed by designers Jeff Weber and Bill Stumpf: Let's design a chair that's more than not bad for you. Let's design one that's actually good for you. "Since design has become more technology based, we've had to sit in our chairs in front of computers for longer periods, just like everyone else," Jeff said. "We identify with the problems people have as a result of sitting." of us sit most of the day. Not good. A lot of chairs are designed to keep you still as you sit. The results of that enforced immobility? Bad for you. Did you know that, at the end of an average day, we are 1 centimeter shorter than we were when we woke up? That's because of spinal compression, and much of that is because of sitting for hours and hours. Sitting still also reduces blood and oxygen flow, which makes you dull and tired. And most of us sit most of the day. Not good. Work chairs can be health-positive or therapeutic, not merely health-neutral. Work chairs can let us achieve postural equilibrium (the upright balance point when our eyes are vertically aligned with our hips) naturally, no matter what our spinal curvature. More than 30 professionals physicians and Ph.D.s in biomechanics, vision, physical therapy, and ergonomic helped us test these ideas and develop experiments to determine whether a truly health-positive chair was possible. Prototypes followed, with experts sitting in them and offering appraisals of what was good and what wasn't. Researchers conducted laboratory experiments involving kinematics, preferred postures, pressure distribution, seated tasks, and metabolics. These guided the development of Embody and confirmed its health-positive benefits. After Bill passed away in 2006, Jeff built on Bill's inspiration and gave the chair its function and form. "Design," he says, "is the connective tissue between people and the world." For many of us, our computers are the world, and in creating Embody, Jeff made a healthful, harmonious connection between people and their computers possible.